Automated "closed loop" lead analysis, assignment, distribution and reporting. TactiCom's lead & contact management system automates the entire lead processing function, from lead capture, analysis and assignment, through to "closed loop" contact management and detailed status / trend reports. We know you know your business! We will make suggestions based on two decades of management consulting experience with our customers including Intel, Texas Instruments and the United Nations. Our systems automate your business process. Ultimately your LMS will automate your lead closure process using todays technologies including internet, web, social media and mobile apps. Our Lead Management Systems are centralized, secure, network-based solutions. Each Lead Management System is custom configured from our library of over 400 lead management functions. Our semi-custom approach not only ensures your system functions according to your lead management process, but also dramatically reduces both the development and the "total cost of ownership". Contact TactiCom for more details and to discuss your requirements. 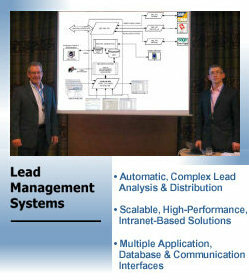 Lead Management Systems By TactiCom, Inc.